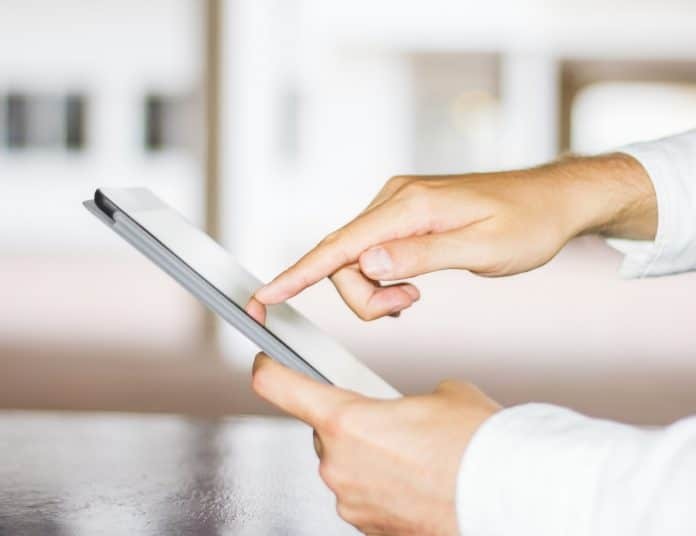 With a vast array of devices available from innumerable brands, it’s no wonder that undergoing the purchase of a new technological device can cause enough stress to make your head spin. Perhaps you’re in the market for a new tablet and a NOOK tablet has caught your eye. No matter what has led you to this buyer’s guide, we’re here to help you sift through the available NOOK tablet models, features and specs to easily help you pick one to meet your needs. Read on to learn all you need to know about these tablets from Barnes & Noble. What Is a NOOK Tablet? These are devices released by Barnes & Noble, the widely-known bookseller. According to the company, their tablets are optimized for readers. Built on the Android platform, their offerings range from a model priced under $50 that’s perfect for reading and light web browsing to a high-performance one loaded with impressive features and specs. All the tablets come loaded with proprietary Barnes & Noble apps that make acquiring, organizing and enjoying books and other content a cinch. Several of them are in partnership with Samsung in which Samsung’s devices are utilized and have been NOOK branded. What’s the Difference Between a NOOK Tablet and a NOOK eReader? The current NOOK eReader, the NOOK GlowLight 3, is solely meant for reading. Content appears in black and white, and the screen mimics the look of paper for easy reading. Their tablets, on the other hand, are equipped with color screens. While still optimized for reading, these devices are also capable of web browsing, email checking, video watching, game playing and most other activities you would expect to use a tablet for. Where Can I Purchase a NOOK Tablet? You can view, compare and purchase all of Barnes & Noble’s NOOK tablet offerings from their website. They are also available inside their physical retail locations if you would prefer to test them out in person before buying. 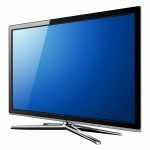 You will also find them being sold by other retail outlets online, but take note that many of those offered may be refurbished or used units. You’re eyeing that tablet priced under $50, but will it do all that you need it to? That $350 model certainly is impressive, but do its features make it worth the cost? 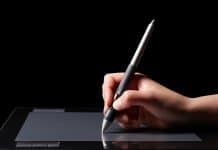 We’ve invested hours of our time to sift through not only what Barnes & Noble and Samsung have to say regarding their devices, but also what numerous consumers think after days, weeks and sometimes years of actually using these tablets and putting them to the test. You can trust our unbiased reporting on the performance and benefits of each device covered in this guide, as our goal is to simply help you choose which is worth your hard-earned dollars and best suited to perform your needed functions. How Much Should I Expect To Pay for a NOOK Tablet? Current NOOK tablet models run from a lowest price of $49.99 to a highest price of $349.99 for brand-new models. If you choose to go the used or refurbished route, you can certainly come across ones that sell for less. Just keep in mind that units that aren’t new likely won’t be eligible for any sort of warranty. 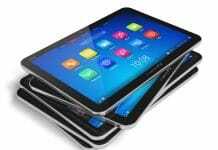 All of the tablets discussed in this overview are covered by a limited warranty that includes both parts and labor for the duration of 12 months. There are currently four different NOOK tablet models available on the market. Browse the features and specs below for each of them to decide if you must get your own hands on one. This NOOK tablet with a 7-inch screen is geared toward avid readers who want a device that’s both the perfect size and optimized for reading, yet provides other key features of a tablet. As a Barnes & Noble product, the device links to your account with the bookseller. The company boasts that this allows you access to their huge selection of books, of which over one million are available to purchase for as low as $4.99 or sometimes even less. Unlike with a more traditional dedicated eReader, this color tablet allows for reading newspapers and magazines in vivid full color from the Barnes & Noble newsstand. More than just excellent for reading books, magazines and newspapers, this tablet comes with full access to GooglePlay™, which means that the wide range of Android games, movies and apps are all available to download. The device is equipped to handle light web browsing and video watching. 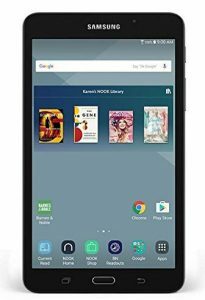 The NOOK Tablet 7” retails for $63.99 and can be purchased from Barnes & Noble either online or in-store. 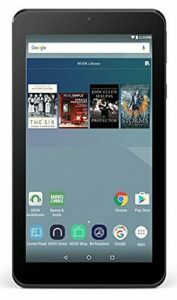 The Samsung Galaxy Tab A NOOK is Barnes & Noble’s current offering in the entry-level tablet market. This device is intended to stand as more of a functioning tablet, rather than just mostly eReader. With that said, it’s still a good option for you if you will primarily be using it for reading books, magazines or newspapers. It has many of the same features that we already discussed on the NOOK Tablet 7", such as accessibility to Barnes & Noble reading material, access to GooglePlay™, bookshelves for separate users and parental controls. With that in mind, we’ll dive into the features that set the Tab A apart from the aforementioned NOOK Tablet. While the screen on the Tab A is the same seven-inch size, it gets upgraded to an HD display. The device boasts high-resolution rear and front cameras that are completely adequate for video chatting but are unlikely to provide you with consistently crisp and clear photos. The Tab A also gains a boost in battery life. Barnes & Noble states that it should stay powered through approximately 11 hours of internet use; however, watching movies and other streaming content would likely cut that time short. This entry-level tablet can be purchased for $83.99 online from Barnes & Noble, or inside one of their many brick-and-mortar store locations. 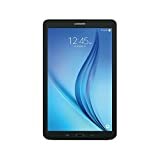 As the name suggests, the Samsung Galaxy Tab S2 NOOK has an eight-inch screen; however, more than just the size of that screen sets this particular tablet apart from the previous two models covered in this overview. This Samsung and Barnes & Noble collaboration is equipped with a Super AMOLED display with an improved resolution of 2048x1536. When those specs partner with the tablet’s Octa-Core processor, you gain superb video watching and game playing over the two more entry-level NOOK device options. While the S2 NOOK does come with a significantly higher price tag than the Tab A, it’s justified due to the improved viewing on a better display and the addition of 32 GB of built-in memory. The NOOK Tablet and Tab A are only equipped with eight GB comparatively. This tablet is built to be super-thin and lightweight, and unlike the previous two models, also delivers fast performance. Another unique feature provided on this model is that it allows for unlocking the device through the use of fingerprint technology. Taking into consideration this model’s features, speed, display and price, we recommend that you opt for this NOOK tablet if you’re looking for more of a high-performance experience rather than just a device primarily for reading. If you will mostly turn to the tablet to read, you may be better off saving some money and choosing one of the more entry-level NOOK options. The Samsung Galaxy Tab S2 NOOK can be purchased for $349.99 from Barnes & Noble online, as well as inside their retail locations. 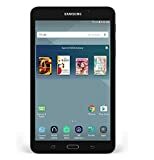 While the Samsung Galaxy Tab E NOOK comes equipped with the specialty Barnes & Noble features and apps included in the previous models already covered above, the largest selling point for this device is its larger 9.6-inch screen. Having the largest screen offered on a current NOOK tablet, this device is especially well-suited for reading magazines and watching movies. You’ll notice that this tablet has a lower price over the Tab S2 NOOK even with its enlarged screen, and this is because this model does get a few downgrades from the S2. With only 16 GB, the Tab E is equipped with less memory. While it does have a beautifully large HD display, this tablet lacks the level of resolution found in the Tab S2. Take into consideration the content you prefer to consume before choosing which tablet would best suit your needs. The Tab E is likely a great option for you if you want to read magazines in vivid color on a great-sized screen. 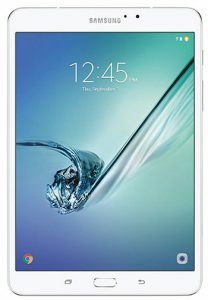 The Samsung Galaxy Tab E NOOK was originally listed for $197.99 by Barnes & Noble. Check it out and purchase on their website by clicking here, or visit one of their many retail store locations. After reviewing the full line of NOOK tablets, our final opinion is that we would recommend the purchase of the 7” NOOK Tablet if you’re looking for a great product appropriate for children to use, or if you need a device that’s small, portable and great for travel. If you’ll primarily be reading but also want to access web content, then the Samsung Galaxy Tab A NOOK is worth a look. 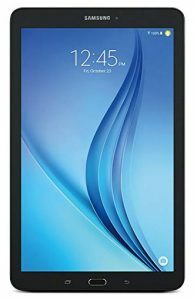 If you’re searching for a high-performance tablet that can rival Apple’s iPad, then you need look no further than the Samsung Galaxy Tab S2 NOOK. And last but not least, lovers of magazines, comics and picture books will find the Samsung Galaxy Tab E NOOK well-suited for their content viewing habits. The bottom line is that Barnes & Noble has been successful at launching tablets that are very capable devices, with some of them having impressively low price tags. No matter the level of functions you need your next tablet to perform, there is likely a NOOK device available to fulfill those needs.